Do you often notice strands piling up on the floor while combing your hair? Is it embarrassing to untie your hair in public because of how much hair comes off on your hair tie? Well, you’re not alone. Hair loss is a problem that is faced by many people all over the world. So, what’s a quick solution for this problem? Hair growth tonics. Hair tonics are medicinal solutions that are specially formulated to restore hair growth and thickness. If you are on the lookout for a good hair growth product, check out our list of the best ones available on the market right now. Hair tonics (often referred to as ‘friction lotions’) help stimulate blood circulation in the hair follicles for healthy hair growth. They usually contain oil, alcohol, and ethanol and come in either liquid, gel, or semi-solid form. Massaging a hair tonic onto your scalp on a regular basis can reverse baldness and make your hair grow longer and thicker. These tonics also moisturize a dry scalp, add shine to your locks, and reduce breakage and split ends. 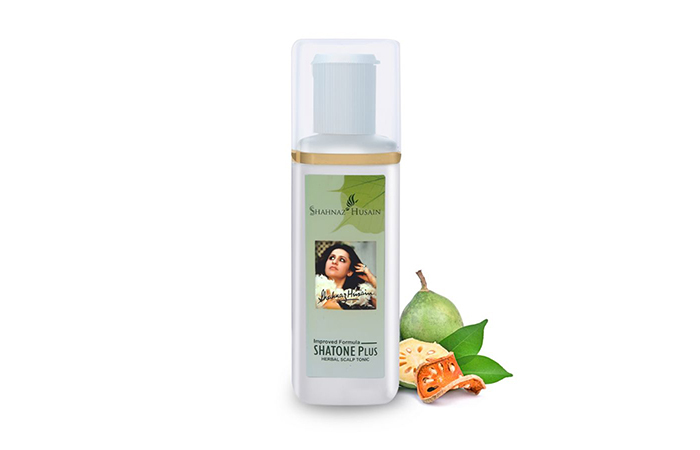 Shahnaz Husain’s Shatone Plus Herbal Scalp Tonic is infused with a blend of therapeutic extracts that control dandruff and other scalp conditions. Its formula stimulates hair growth and thickens each strand. This tonic contains extracts of triphala, shikakai, methi seed, bael giri, gurhal, and germinated mattar. These ingredients control hair loss and prevent premature graying of hair. This product also claims to reduce breakage and split ends. 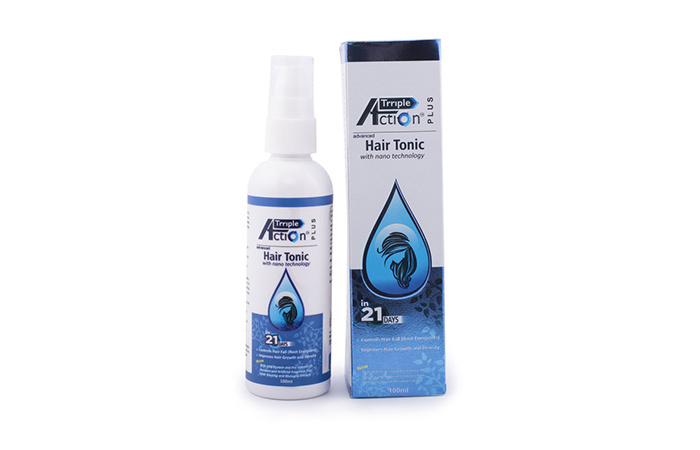 This clinically tested hair tonic accelerates hair growth and controls hair fall by rejuvenating your hair follicles. Its formula is enriched with root energizers and group B vitamins. These ingredients penetrate the damaged hair follicles and restore proper blood circulation and nutrients into their core. This product claims to reduce hair fall within 90 days. This Ayurvedic hair tonic is powered with natural herbs like almond, bhringraj, aloe vera, rosemary, hibiscus, mulethi, and jatamansi. These naturally-derived ingredients nourish your hair and promote hair growth. This formula helps fight premature hair loss and graying. It works in three ways – treats hair thinning, improves hair density, and curbs hair fall. The best thing about this hair tonic is its delightful fragrance. 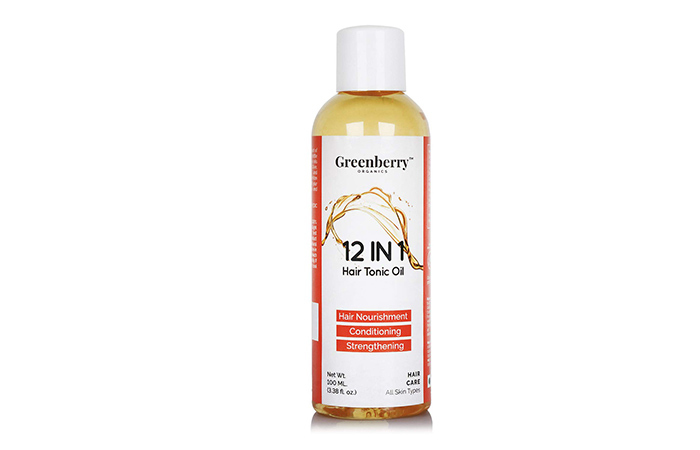 Greenberry Organics 12 In 1 Hair Tonic Oil is a blend of nutritive oils that provide ample nourishment to your hair cuticles for healthy hair growth. It soothes and moisturizes your scalp. 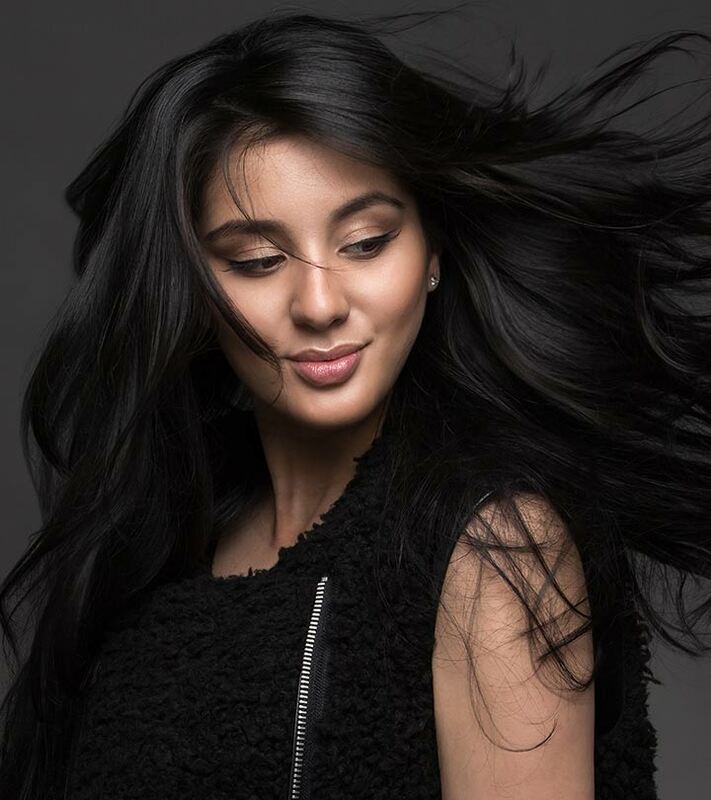 The goodness of powerful oils like jojoba, Indian gooseberry, organic murumuru butter, fenugreek seed, rosemary, argan, seabuckthorn, spearmint, almond oil, and olive oil will help you get the black, thick, soft and shiny hair of your dreams. 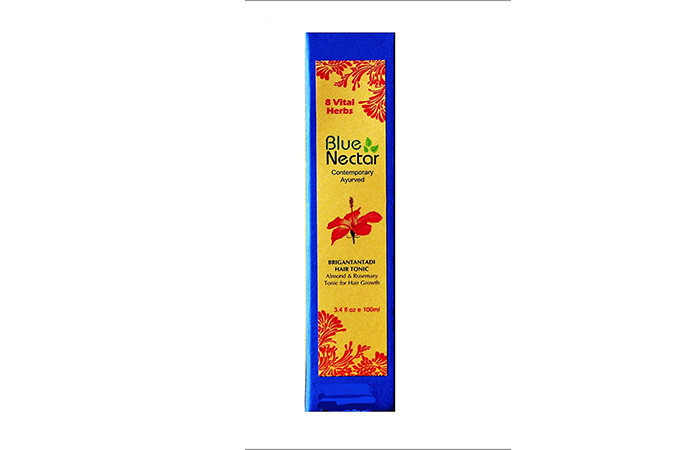 The product claims to reduce dandruff and keep your scalp free of infections. 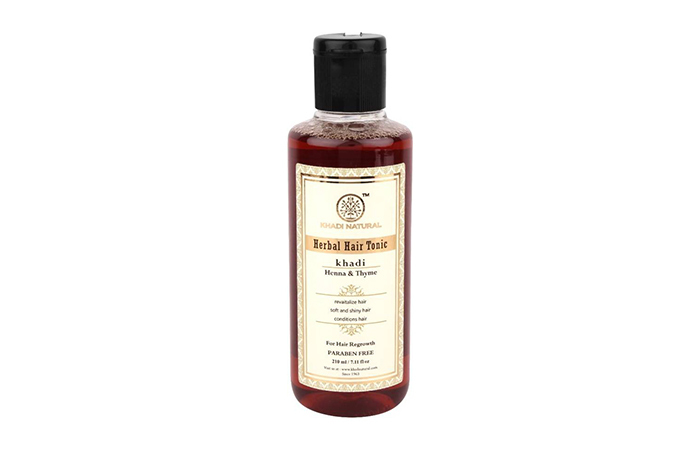 This Ayurvedic hair tonic from Khadi Natural is useful for preventing hair fall and premature graying of hair. It is a non-oily formula that contains potent extracts of neem, aloe vera, amla, shikakai, thyme, henna, basil, jatamansi, and nagarmotha. These extracts are blended in peppermint, ylang-ylang, rosemary, and jojoba oils. This herbal tonic will condition your scalp and hair while inducing healthy hair growth. It revitalizes damaged follicles, strengthens your roots, and restores your hair’s natural luster. Aloe Veda Distil Bhringraj Scalp Tonic is prepared using natural ingredients like neela amari oil, amla extracts, licorice root extracts, sakralata extracts, anjanam extracts, and yashtimadhu extracts in a base of coconut milk and coconut oil. This rich blend nourishes and conditions your hair, strengthens your roots, and revitalizes hair follicles. It prevents hair fall, controls dandruff, and promotes hair growth. Anjanam and amla oil prevent premature graying of hair by imparting a blackish pigment to discolored hair. 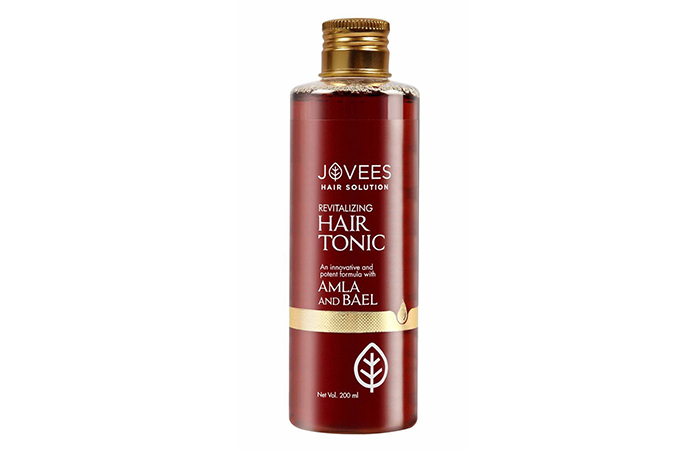 This herbal hair tonic contains 100% natural ingredients like bael, jatamansi, amla extracts, and rita. These ingredients revitalize your hair and scalp to reduce hair fall and promote healthy hair growth. It is a non-sticky, lightweight formula that glides smoothly on your scalp. It keeps your hair bouncy post wash and does not weigh it down. With regular use, this tonic can also improve your hair texture. 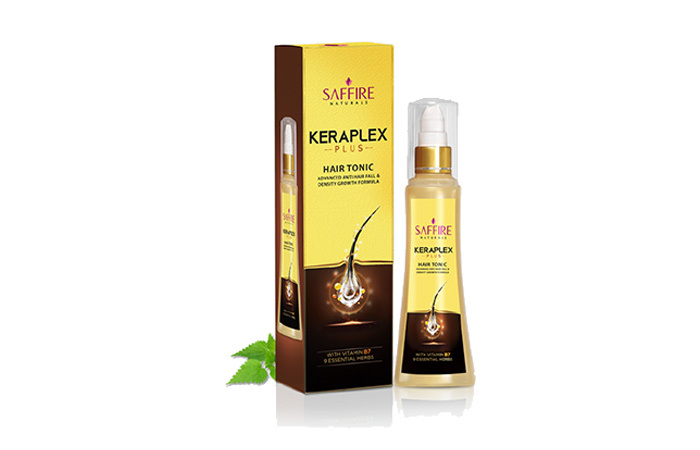 Saffire Keraplex Plus is an advanced medicinal tonic for all hair problems. It is infused with the extracts of Ayurvedic herbs like amla, jatamansi, reetha, hibiscus, bhringraj, neem, arnica, brahmi, and aloe vera that repair damaged hair fibers and prevent hair fall. This tonic claims to prevent hair loss, increase hair density, and rejuvenate scalp cells for healthy hair growth. QRAA Triple Action Plus Hair Tonic is an Ayurvedic treatment formulated especially for preventing hair fall. 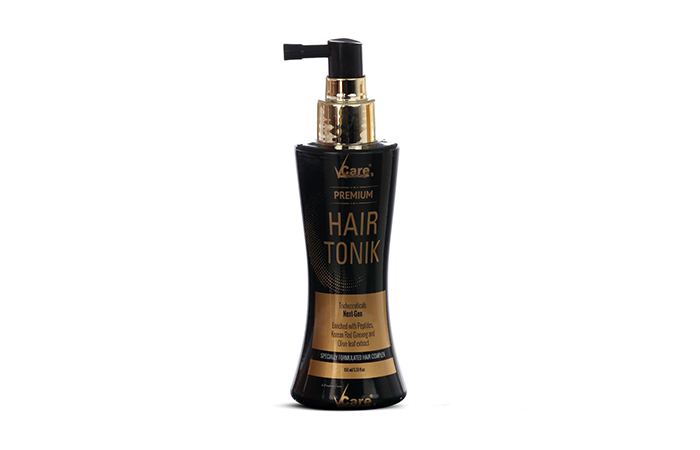 It is prepared using 16 natural herbs that protect your hair from damage and breakage. These ingredients prevent premature graying, split ends, and other visible signs of aging. They help restore hair growth in just 21 days. This formula is light, non-greasy, and gets absorbed quickly. Vcare Premium Hair Tonik is enriched with peptides, Korean red ginseng extract, olive leaf extract, and other active ingredients that solve all your hair and scalp problems. This formula revives hair growth, treats damaged hair, and controls dandruff. With regular use, it thickens each strand to add volume to your hair. 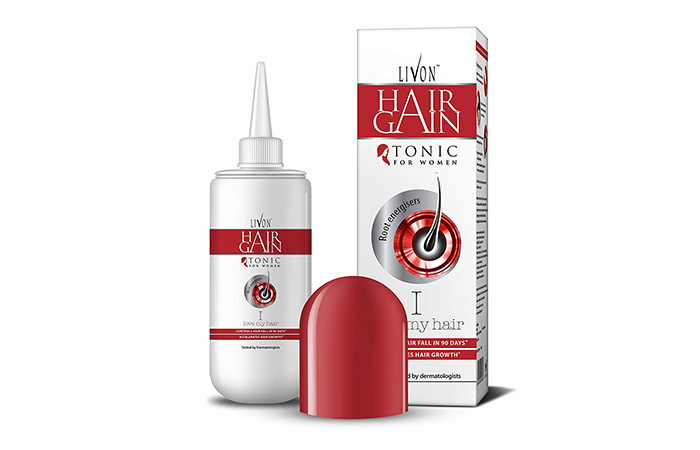 The idea of using a hair tonic can be a bit overwhelming, but it’s worth a try! Now that you know about the best hair tonics, what are you waiting for? Pick your favorite product, try it out, and let us know how it worked for you in the comments section below. Suffering from terrible hair related problems? 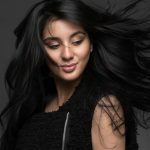 Want to learn simple homemade magic potion for healthy hair? Here is a homemade hair tonic DIY for you to learn. Most of the time, hair fall is directly related to follicle health. Hair follicles get clogged due to factors such as an oily scalp, pollution, and the build up of products.